When you live in a close-knit community, you benefit from its warmth and support; you share its values and vocabulary and world-view; you are guided by its rules and guarded by its vigilance; you are nourished by its love. But sometimes it’s hard to be different, particularly if you are different in some way that you cannot help, and if you are different in a way that goes against deeply ingrained beliefs, it’s particularly hard. Sometimes you need a break. Sometimes you need another community, one that understands you and understands both your background and your backstory. Sometimes, if you are the Orthodox parent of a lesbian, gay, bisexual, or transgender child, you need the annual Eshel parent retreat. A place where you can let down your guard, just for a bit, before you return to your own world. This year, as they have for the last six years, Mark and Ellen Schwartz of Englewood went to the retreat. It’s always held over a weekend, including Shabbat, so participants have to drive there on Friday morning. This year, it was complicated by the snowstorm that snarled traffic and fractured nerves the day before; some parents who had planned to go found that they were too wiped out by their unexpected multi-hour trips back home to go. “He’s an iconoclast, and he doesn’t mind ruffling feathers,” Mr. Schwartz said. “Not the feathers of the rabbinate in Israel, and not of their counterparts in the RCA,” the Orthodox Rabbinical Council of America. “He came out very strongly in favor of the inclusion of our LGBT children in the community. “He described the unconditional love that we have to feel for our children, and that we have to make space for them. Mr. Schwartz has seen some changes in the people who come to the retreat. “There certainly are more charedi people there than usual,” he said. “In the first year or two, it was by and large a modern Orthodox crowd, with a smattering of charedi and yeshivish people. I have to think that it’s much more difficult for them to associate with Eshel. But he was not going to do that. Ahavath Torah is home. “My wife’s parents, Evelyn and Herbert Deresiewicz, were members there for more than 40 years. Ellen’s brother had his bar mitzvah there. Ellen and I were married there, our daughter Jamie was named there and grew up there, and our son Daniel had his bar mitzvah there. He also noted another difference in this retreat. “There seem to be more parents of trans children. We broke into smaller groups, and in one group I would say that out of the 14 or 15 people there, there were only two other people who did not have a trans child. This is a small sample, I know, but I am astonished by how prevalent it is. These parents, in a shot from earlier retreats, get support from a community that understands them. There is a big difference between being L, G, or B and or being T, he said. Being lesbian, gay, or bisexual determines who you love; being transgender is profoundly about who you are. The retreat has been held six times, so the Schwartzes have been to each one of them. Their impetus for going has changed over the years. At first, they went because they needed the support; now they go because they know they are well positioned to offer support. Mr. Schwartz is enthusiastic about another Eshel project, the Eshel high school pledge. The pledge is a plea to Orthodox day schools to agree to treat LGBT students with the same respect and dignity that every student deserves, to make Orthodox day school communities inclusive and loving, to ensure that LGBT students at those schools survive their adolescences as relatively unscathed as other students do. It’s also a got a strong anti-bullying component. So far, local Orthodox high schools have not taken the pledge, but some of them have incorporated some of the inclusive language the pledge recommends. Miryam Kabakov is Eshel’s executive director. She agrees with Mr. Schwartz that there seem to be more parents of trans children; this is a mirror of what’s happening in the outside world, she said. More people are coming out as transgender. “We had a couple who were new this year. The kid came out to them three months ago as gay; he came out as trans yesterday. Despite the changes in the outside world and within the community, “we always have the same mission,” she said. “It is to keep families intact, to have parents do no harm, and see that children are not harmed, and to have parents learn to love their children. “One thing that struck me particularly this year is that the people who showed up have something that separates them from their own community, and that they cannot relate to their communities and their families and their friends because of it. 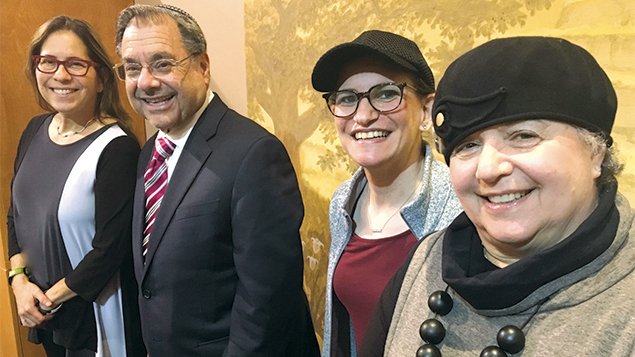 Rabbi Jeffrey Fox, who lives in Riverdale, N.Y., and is the rosh yeshiva of Yeshivat Maharat, led Kehillat Kesher of Tenafly and Englewood for seven years, from 2003 to 2010. He also is a longtime participant in the Eshel retreat. “My son, who now is a senior in high school, at SAR, came out to me and my wife the summer before he was a freshman in high school, and he came out publicly that December,” Rabbi Fox said. “I went to the first retreat just as a parent — it was around Martin Luther King day in 2015. I was just trying to process. “Since then, I have come back as both a parent and also as a teacher. “There are people there who have built a pretty deep community. It is often the case that when the kids come out of the closet, the parents go into it. The retreat really is the only setting where people can be fully integrated. “I thank God that we live where we do and when we do,” Rabbi Fox continued. “I can’t say enough good things about my son’s school in general, and in particular about how they responded when he first came out. It was a non-issue. His friends were great. His teachers were great. He was the first one in the school to come out so publicly. That’s particularly true in the modern Orthodox community, where people are not insulated from the outside world. Rabbi Shlomo Riskin gave the keynote talk this year. Miryam Kabakov, Eshel’s executive director, is at the left; Peninah Gershman and Suzi Fuld, right, chaired the retreat. Rabbi Fox has become a resource for LGBT Jews. “After my son came out there were a bunch of kids who weren’t out yet but who were coming to him. Some of the kids were really struggling. Some of them leaned on him, and some leaned on me through him,” he said. What does he tell them? “I tell them that it gets better,” he said. “And that’s the truth. It does get better. The needle moves very quickly. How did it change so quickly? “I don’t know, but I do think that it’s like in the outside world. In every school, and in every community, everyone knows someone who is gay,” Rabbi Fox said. Acceptance of LGBT people is one thing, but what about the halachic prohibitions? “I think that most kids who are coming out — and most adults too — don’t think about that first,” Rabbi Fox said. “The first question the community wants to figure out is about Jewish law, but most people just want to live their lives, and for the most part those kinds of questions are way down on their lists. It’s more about how to be honest with themselves and with their parents, and for some adults it’s about how to be honest with their spouses. There are many older adults coming out, people who have been in the closet all their lives, and it causes enormous pain. “So when they are trying to figure this out, most people aren’t bothered by Vayikra” — that’s the book of Leviticus, which includes the proscription against a man lying with a man as if she was a woman. There is some work being done on the issue, he said, but right now there are more questions than answers. “People are asking the harder questions. In the Orthodox world, you take for granted a set of givens, so how do we operate within that structure? “I have worked with a number of lesbian couples. How do they observe hilchot niddah?” That’s family purity. “And gay men want to know halachically what type of behavior comes with what kinds of punishment. Are there some things that are less bad than other things? 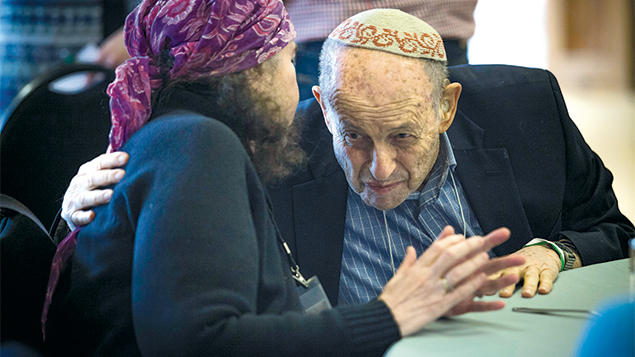 “There aren’t too many addresses for these kinds of questions.” Eshel is a main address. Rabbi Fox got involved in the trans community through a conversion he did years ago, he said. “That is even more complicated in just about every way,” he said. “There, the halachic issues are far more complex and confused.” He’s worked with about 50 Orthodox trans Jews. Among the situations he’s confronted was a closeted trans man — he had been born a woman but presented as a man and was known as a man — whose mother had died. He had dealt with his situation until then by showing up in shul late enough never to have to be counted in the minyan, and never accepting any honors. But what should he do about saying kaddish for his mother? And being counted in the shiva minyan? “He was great,” Rabbi Fox said. “He is coming at this with a different kind of understanding. He is almost twice my age and has twice my experience. “He said that from his time both at Lincoln Square and in Efrat, he understands the need for compassion. Compassion has to be embedded in rabbis’ responses, in terms of both pastoral care and halacha. “His main theme is that compassion is part of halacha. It’s not as if there’s halacha here, on one side, and compassion there, on the other side. Eshel is online at http://www.eshelonline.org.